Mish Mash SMASH Bash! Fundraiser for SMASH! Come vogue, lindy hop, and game the night away as we raise some cash for SMASH! All proceeds go to develop affordable housing for slum affected residents in Liberty City and LGBTQ Homeless Youth! Please consider sponsoring a low-income person if you can’t personally attend! Your entry fee includes a drink and food! We welcome co-sponsors United Houses of Florida and Gay Vista Social Club! We’re gonna have a BALL! Thanks to Sugar Sullivan for providing the Lindy Hopping demonstration! 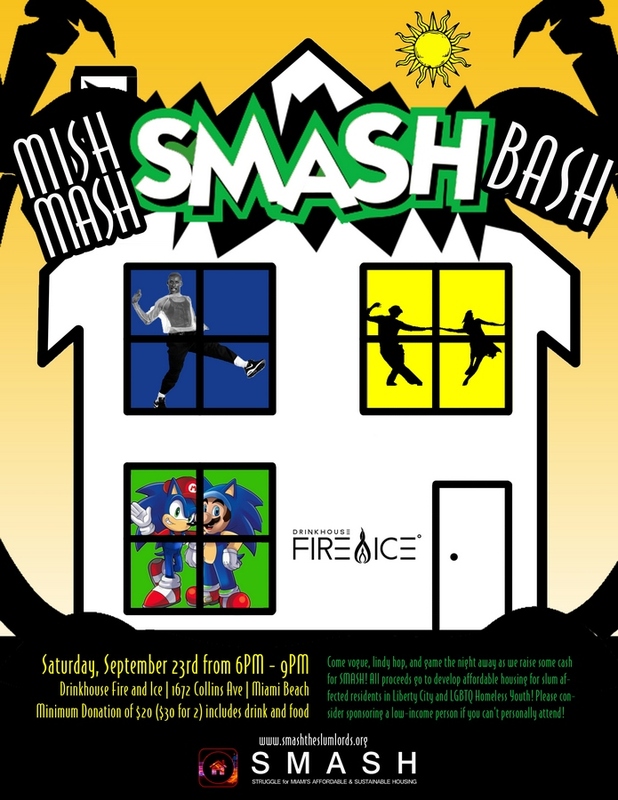 We’ll have plenty of set-ups for Super Smash Bros and Just Dance! If it seems like a random mish mash of activities, thats cuz it is! Struggle for Miami’s Affordable and Sustainable Housing is a 501 (c) 3 non-profit organization. SMASH’s Mission is The creation of a Community Land Trust that will adequately address the needs of inner-city Miami residents affected by the symptoms of gentrification (slumlords, rising rents, lack of community control), and that is shaped, developed and implemented by those same residents.